ICTO - FAQ » Staff Mail - Outlook » Outlook Client » Email » Can I copy the Lotus Notes document links to the email in Outlook? Open Lotus Notes and select one or more documents in your database. Then right-click while the pointer is over the list of documents. Select “Copy Selected as Table”. Then open the email you are composing in Outlook, and paste the selected items. Recipient can click the “Notes Link”. 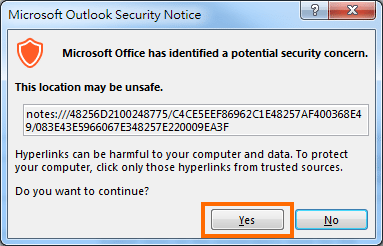 Outlook will prompt a message box. Click “Yes” to launch the Lotus Notes application and direct to the document. *Noted that the Application link cannot be copied to Outlook.